Divine Mercy: 91: Every morning during meditation, I prepare myself for the whole day‟s struggle. 91: Every morning during meditation, I prepare myself for the whole day‟s struggle. Holy Communion assures me that I will win the victory; and so it is. I fear the day when I do not receive Holy Communion. This Bread of the Strong gives me all the strength I need to carry on my mission and the courage to do whatever the Lord asks of me. The courage and strength that are in me are not of me, but of Him who lives in me – it is the Eucharist. 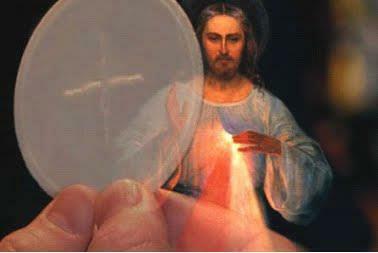 O my Jesus, the misunderstandings are so great; sometimes, were it not for the Eucharist, I would not have the courage to go any further along the way You have marked out for me.